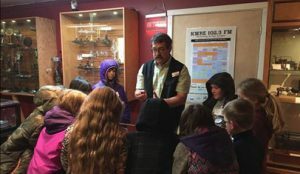 People often ask us here at SPARK Museum of Electrical Invention how we run the entire operation — including galleries, membership, field trips, administration, bookkeeping, weekend shows and tours — with just two employees. The answer is simple: We don’t. We just couldn’t do what we do without our team of volunteers, who help with everything from Gift Store inventory to cleaning mirrors in the washrooms to joining our board of directors to guiding guests on their tours of the museum. That last group — our docents — is in the spotlight today. In particular, the incredible docents Bill Englander and Ken Voelker. Bill, an inventor, has made two of our most popular interactive devices, and Ken is an outstanding educator with a knack for enthralling our youngest visitors. Let’s learn more about them. Ken Voelker does what he does best: holding young visitors in rapt attention at SPARK Museum of Electrical Invention in Bellingham. That describes Ken perfectly. Knowledgeable, helpful and great at mesmerizing young learners. Bill Englander stands near one of his mesmerizing inventions at SPARK Museum of Electrical Invention in Bellingham. Bill’s as successful as he is at dazzling visitors because of his passion for science and his dedication to sharing that passion with others. Bill makes SPARK Museum’s fantastic artifacts come alive for visitors and students of all ages and all backgrounds and from all over the world. 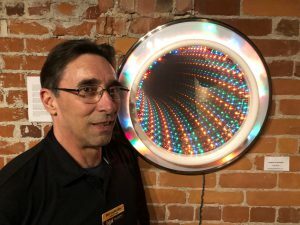 Some of the excitement in the eyes of visitors comes from gazing at — and into — devices that Bill has created, such as the mesmerizing infinity portal hanging near SPARK’s front desk. What do people like most about SPARK Museum of Electrical Invention? It’s not the newly interpreted galleries or the priceless artifacts. It’s not the the MegaZapper show. It’s not the 16 interactive devices and displays or the super cool Gift Store. Those things might be amazing, but they’re not what visitors love the most. No, the most frequent comment from visitors about what they loved about their SPARK experience is the service provided by wonderful docents like Bill Englander and Ken Voelker. We couldn’t do what we do at SPARK without them.